This past semester, I read Haruki Murakami’s book “What I Talk About When I Talk About Running” while training for the Philadelphia half marathon. The book opens up in Hawaii, as the author reflects on his island summer runs. He describes his feelings, the weather, the landscapes, the routes… painting colorful pictures in his reader’s mind. I found Murakami’s writing to be incredibly motivating and inspiring. Surely, any reader will feel an urge to drop the book, go for a long long run, and never give up. 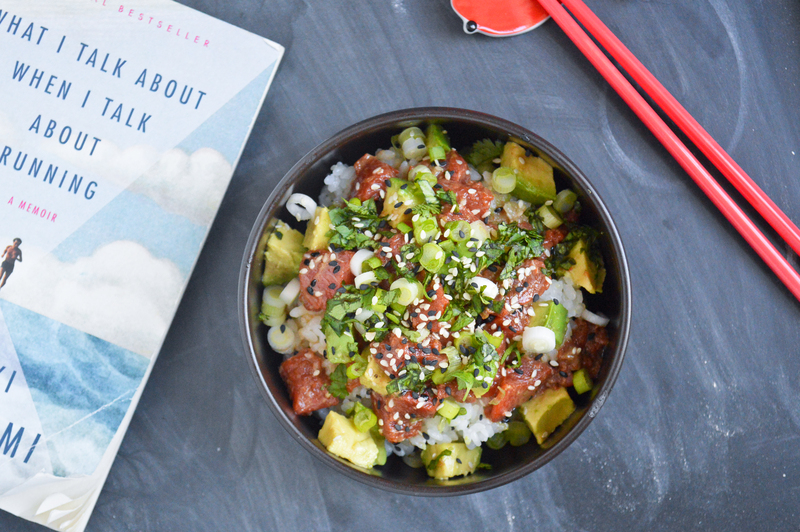 While that thought certainly crossed my mind, his book also made me want to finally try my hands at Poke (though that could also be the influence of Anthony Bourdain’s “Parts Unknown”, which includes a great episode in Hawaii)! Regardless of the specific cause, all the talk about Hawaii really made me crave the island’s staple dish. 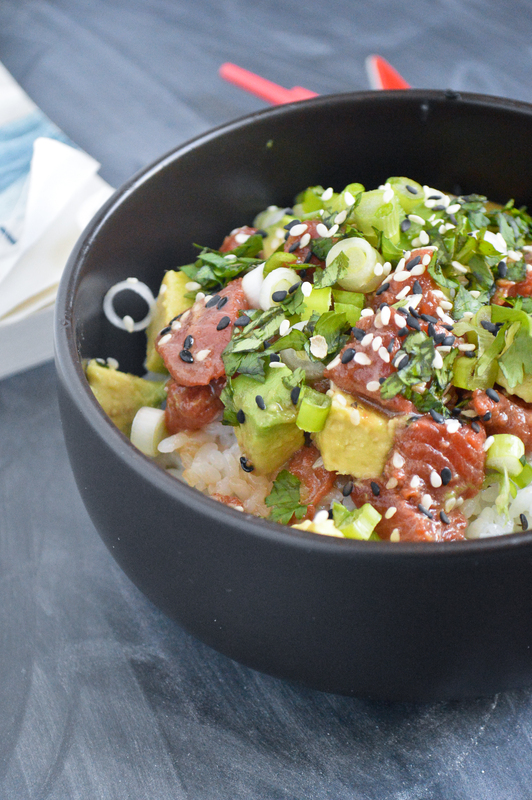 Poke consists of a steaming bowl of sticky rice, topped with some freshly chopped raw fish previously soaked in marinade and various garnishes. While it is often prepared with tuna, I chose salmon for its fattiness. This is by no means a traditional recipe and it might not be that authentic, but it’s pretty damn delicious if you ask me! I love the contrast between the warm sushi rice, and the cold fish, the creamy avocado and the bright umami flavor of the marinade. This dish really comes together in an explosion of flavors! Since I have never been to Hawaii, I can’t wait until the day I’ll try the real deal on the island. In the meantime though, that’ll have to do! Bon appétit! EDIT: I recently tasted a really delicious rendition of this dish in Indonesia, as part of three weeks in South East Asia! Of all places, I had it at the restaurant of my Diving Center on Gili Trawangan island, and it really blew my mind! The chef used Spanish Mackerel, which was fatty as can be, in the best possible way. 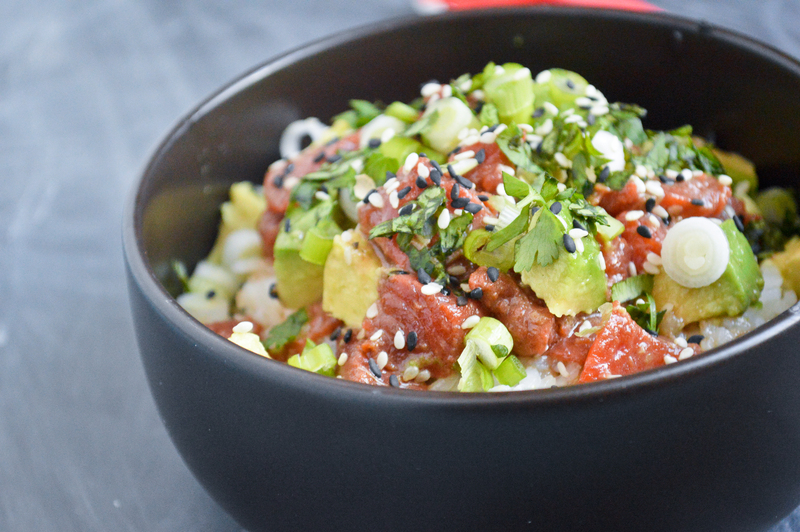 The marinade had a strong umami flavor, with a dominating soy taste, but the dish was brightened by lots of minced fresh scallions and some creamy avocado slices. It blew my taste buds away honestly so Spanish Mackerel shall be my next try. Cover the rice with 1/2 cup water and cook it until all the water is absorbed (about 15 minutes). Meanwhile, prepare the fish. Whisk together the soy sauce, rice vinegar, sesame oil and sesame seeds. Cut the fish into medium-sized cubes and toss them with marinade in a small bowl. Refrigerate it. Prepare the garnishes: thinly mince the scallion and dice the avocado into cubes. To serve, start with the base of rice on the bottom, and top with the fish with all the marinade left, and the garnishes. Dig in right away, while the rice is still warm and the fish really fresh! Recouvrez le riz avec 1/2 tasse d’eau et laissez-le cuire jusqu’à ce que toute l’eau soit absorbée (environ 15 minutes). Pendant ce temps, préparez le poisson. Mélangez la sauce soja, le vinaigre de riz, l’huile de sésame et les graines. Coupez le saumon en cubes et recouvrez-les de marinade dans un bol. Mettez au frais. Préparez ensuite les garnitures: émincez l’oignon de printemps et coupez l’avocat en cubes. Pour servir, commencez par une base of riz et recouvrez-la avec le poisson et sa marinade, ainsi que les garnitures. Dévorez de suite, pendant que le riz est encore chaud et le poisson bien frais! Bon appétit! Posted on June 29, 2016 by julieadPosted in Dinner, Fish, Lunch, Main, Recipes, RiceTagged avocado, delicious, fish, hawaii, light, lunch, marinade, murakami, poke, raw, rice, salmon, sesame, soy sauce, sushi.